Who: The ceremony, which is open to the public, will include remarks by court leaders including F. Donald Sokol, Presiding Judge of the Superior Court of Lassen County; Assistant Presiding Judge Michele Verderosa; Court Executive Officer Rosemari Reed; Ira R. Kaufman, Assistant Presiding Judge of the Superior Court of Plumas County and liaison to the Judicial Council; and David M. Rubin, Judge of the Superior Court of San Diego County and president of the California Judges Association. 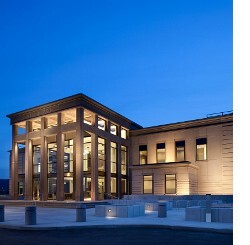 When: Friday, August 3, 2012, 12 noon–2 p.m.
What: The program will include remarks and tours of the new courthouse. Where: The new courthouse is at 2610 Riverside Drive in Susanville. Why: The grand opening celebrates completion of five years of planning, design, and construction for the new 42,000-square-foot courthouse, which replaces three overcrowded and inadequate facilities. The new courthouse, with three courtrooms and a hearing room, provides enhanced security and more space, enabling the court to improve access and services. The project was completed under budget in May 2012. More information about the project is available on the project web page. For questions about the ceremony, please contact Nancy Holsey at 530-251-8205, ext.140. Members of the public needing accommodation, such as an assistive listening system or a sign language interpreter, are also requested to contact Nancy Holsey at 530-251-8205, ext. 140, no later than July 27, 2012.